He went to school at Timaru Boys High School, where he was head boy. Bernard was married to Margaret G. Jefferson (nee Robertson, who died on the 12th of June 1996, aged 80). He was a schoolteacher before the war. He volunteered for the RNZAF in 1939, but being older and married, wasn't called up to air training in Rotorua until October 1941. He studied navigation while waiting. At Rivers, Manitoba, he found time to take up curling, and was the only non-Canadian on the winning inter-unit team. He moved to Cambridge in 1985. He was known as BJ his whole life. After the war, he continued as a schoolteacher (of maths, mostly). Service Details: Bernard was enlisted into the RNZAF at the Initial Training Wing, RNZAF Station Rotorua on the 6th of June 1942. Following initial training in New Zealand he embarked for Canada for further training in navigation, including being posted to No. 1 Air Navigation School at Rivers, Manitoba. On passing his courses, he was to remain stationed in Canada as a navigation instructor. He told his grandson Peter Charlton that on one occasion US anti-aircraft batteries mistakenly fired on a plane he was in as he flew to Halifax, breaking his hip. Bernard was promoted to the rank of Sergeant on the 6th of November 1942, which would have been the end of his training as a Navigator. He was promoted further on the 6th of May 1943, commissioned to the rank of Flying Officer. 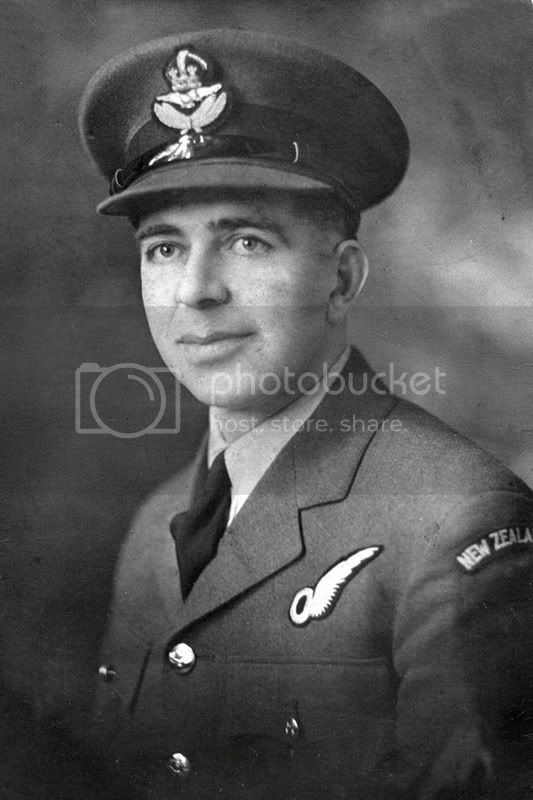 On the 6th of November 1944, Bernard was promoted again to Flight Lieutenant, and he returned to New Zealand from Canada that same month, and was then stationed in Wellington. Bernard's grandson Peter Charlton says, "The incident over Halifax was apparently written up in NZ newspapers, presumably in 1992-1994, 50 years after the event, but we don't have a copy. "He developed some sort of dead-reckoning navigation system with another man, but lost the coin toss to have it named after him (but of course we don't know the name of the other man). "He delivered some important papers in a briefcase cuffed to his wrist. He saw a man killed by a propeller; when he first returned to NZ in 1944. He was the highest ranking RNZAF officer present in Wellington, apparently." Connection with Cambridge: Originally from Timaru, Bernard moved to Cambridge in 1985. He had an additional link to Cambridge. His daughter, Phillippa, married local Ross Boyce, son of Bob Boyce and Ruby (Mahood). Bob was the pharmacist in Cambridge for many years. The Boyce family came to Cambridge at the time of the town's founding. Note: Thanks to Peter Charlton for supplying the above information about his late grandfather. If anyone has further info to add, please contact me.